- Sizes: B, BB and BBB. - Purity :- 99.8% Pb, 0.2% As, or 94% Pb, 6% Sb. Lead Shots is small balls of lead, traditionally made using a shot tower. It is used for a variety of purposes. They are mainly used for shielding atomic radiation from nuclear reactor. Lead Balls is small balls of Lead, traditionally made using a shot tower. It is used for a variety of purposes. One use of shot is in shotguns. Packaging: 25Kg HDPE Bags. We also provide customized packaging as per customer requirements. 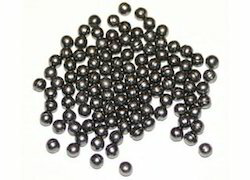 We offer best quality of Lead Ball.